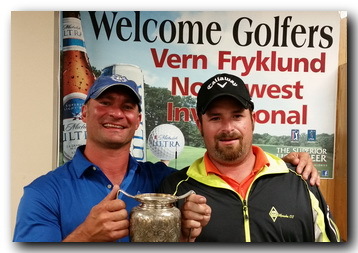 The Mesaba Country Club cordially invites you to participate in the 92nd annual Vern Fryklund Northwest Invitational match play golf tournament to be held on August 30th through Sept. 2nd, 2019. This event draws many of the top players in the state of Minnesota and players from around the country, including Celtic basketball legend and Hall of Famer, Kevin McHale. 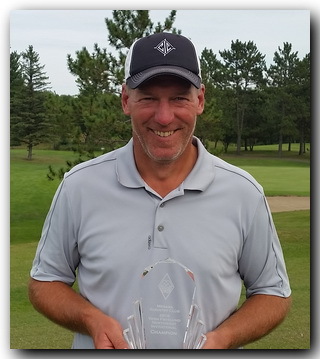 The 2018 tournamentChampion was won by four time champion and former State Champion, Dave Carothers. The event also features players of every handicap level so everyone will have a chance to be competitive in their respective flights. other great prizes valued at $500 or more! Complimentary practice round, featuring skins game and flag events. Qualifying round - 7:30 a.m. to 6:00 p.m. Lunch.................... 11:00 a.m. to 4:00 p.m.
First Round of Play - 7:30 a.m. to 6:00 p.m.
Breakfast Buffet............. 7:00 a.m. to 11:00 a.m. Lunch / Dinner.................11:00 a.m. to 9:00 p.m.
*Match Play Putting Tournament - Stroke Play Qualifying with top four players advancing to match play. Qualifying starts at 5:00 p.m. until approx. 7:30 p.m.
* Texas Hold’em Tournament....Approx.- 8:45 p.m.
Second Round of Play - 7:20 a.m. to 7:00 p.m. Lunch.................... 11:00 a.m. to 3:00 p.m. Final Round of Play - 8:00 a.m. to 4:00 p.m.
Lunch/Dinner... ........ 11:00 a.m. to 8:00 p.m.